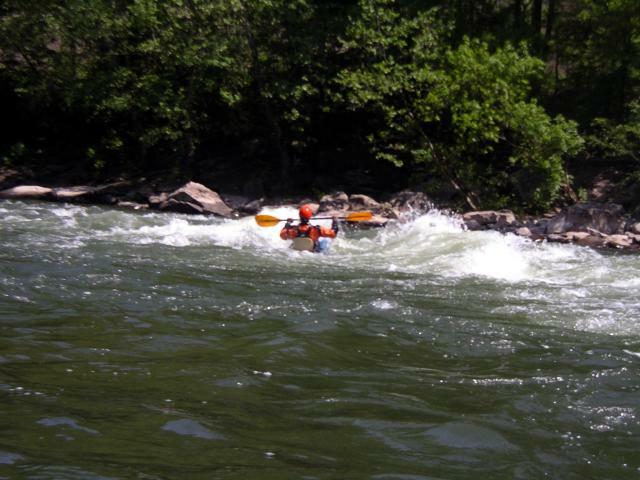 Understand this is a steep creek run with a remote and tight gorge for much of the run with significant rapids. There not a trail along the the stream and trying to hike out would require long and serious climbing up steep terrain to the nearest road, so once your on, you are on. 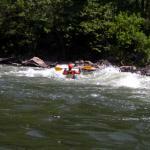 Even a short way past the put-in once you enter the initial rapids getting out is difficult. Much of it is boat scoutable but get out and Scout if at all in doubt. There are some places that unless you know the creek, drops can be blind and not every line is friendly, plus some lead to place you don’t want to be. Additional deadfall hazards/strainer may be frequent and serious at times, so if you can’t see, scout. 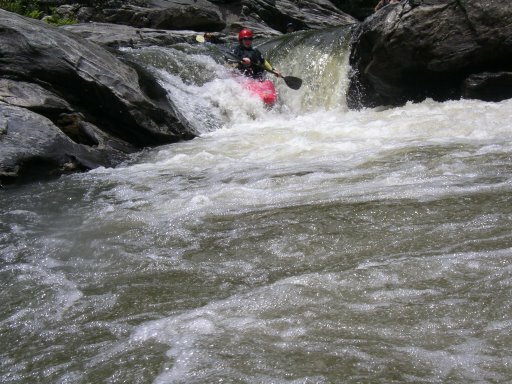 There are a numerous of rapids that demand attention and good skills, especially at higher levels (but don’t under estimate at lower levels either). 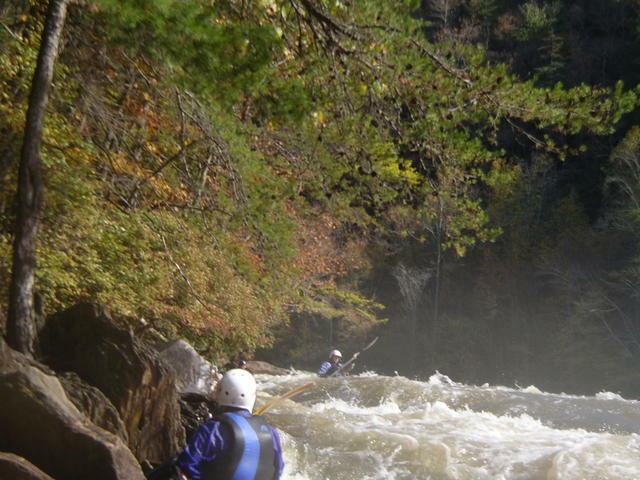 This is not a place for novice’s, it is serious steep creeking. If your not really comfortable on Big Laurel, Wilson Creek or similar runs, then you probably have no business here, it just gets more intense and unlike Big Laurel there is no trail to walk off on and it is really remote. Go into Hot Spring and cross over the railroad tracks, just past the tracks look for a sign for public parking, to the right (right turn) and park in the public lot. You can get of Spring Creek either at the back of the public parking lot or, on the side street you turn-in to to get to the public there is an old steel railroad bridge at the end of the street you can get out underneath and hike back to the parking lot, your choice. Go through Hot Springs on hyw 25 and take a left on hyw 209 going out the far side of Hot Springs. Follow the road until you see a rather serious rapid down the steep bank to your right (this is “City Rapid” – its a class 5 rapid, with a rock ledge on river left and the river/rapid on river right – with pin rocks, hydralics, and lots of hidden rock underwater at the bottom, short but quite serious.) 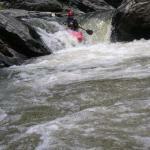 You can pull up on the rock on river left, lift over or otter slide to “walk” this rapid. If you decide to take-out here then after you are below the rapid you will have to climb up the bank to your car. Go through Hot Springs on hyw 25 and take a left on hyw 209 going out the far side of Hot Springs. Follow the road until you see a rather serious rapid down the steep bank to your right (this is “City Rapid”) continue up the road until the road cross the river and at this bridge there is a set of stair up to the bridge, upstream on river right. Just passed the bridge is a gravel pull off to the left of the road were several cars can park. This is a good takeout, though you miss a short but nice run down to city rapid and City Rapid. Directions from Take-out(s) to Put in: If your taking out at the public lot in town, then go back to hyw 25 going through Hot Spring and turn right on hyw 25 and take a left on hyw 209 going out the far side of Hot Springs. If your are taking out at “City Rapid” or the Bridge upstream of City Rapid you will already be on hyw 209. Continue out of town on hyw 209 for serveral miles until you come to a tee (slightly angled) intersection where “Gerenflow Gap Rd.” is to the right running into hyw 209 which turns to the left. Make the left turn and just past the intersection, turn left onto “Puncheon Camp Rd.” (its almost imediately after the T intersection). Go down this gravel road a short way till you get to a bridge over Spring Creek. Just before the bridge is a pull off to the left – park here for the put in. Gauge: There is a gauge painted on a bridge piling upstream in the center of town on Hyw 25.